Located in the in the heart of Ontario’s fruit growing region, our bees take advantage of Niagara’s milder climate and variety of nectar producing flowers. Honey flows begin with apple, cherry and peach blossoms, followed by clover, wildflowers, goldenrod, lavender and aster to create a unique blend of sweet flavours. 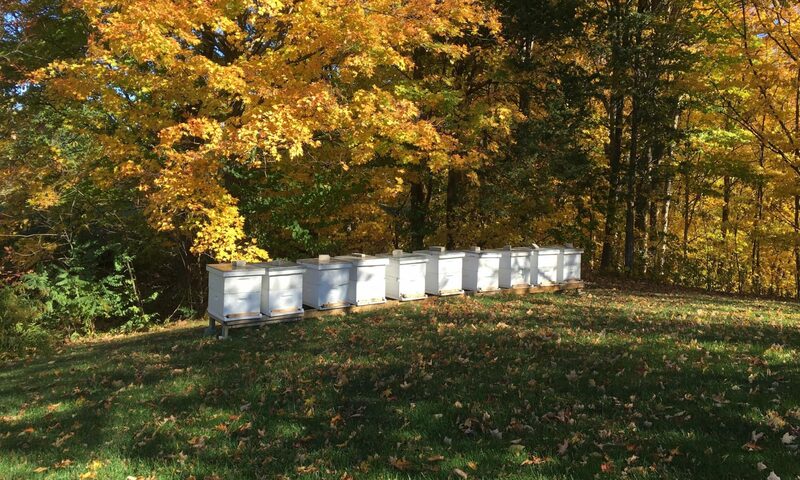 Owners Dennis and Leslie Edell raise healthy populous and gentle hives. Our queens are chosen from productive, gentle and disease-resistant stock sourced from professional queen breeders and from those we raise ourselves. We extract and bottle honey ourselves on premise. Our raw honey is coarsely filtered leaving in pollen grains and never heated above 93F – approximately the temperature in the hive. In this way we feel we maximize the potential health benefits of 100% Ontario Honey. We love keeping bees in our little corner of heaven on the bench in Jordan, Ontario. Come visit us. We hope you and your family will enjoy our honey as much as we enjoy bringing it to you. Dennis Edell started keeping bees on a farm in eastern Prince Edward Island in 1972. As part of a group of new young beekeepers, Dennis helped pioneer successful overwintering techniques on PEI and was one of the first beekeepers to rent bees to pollinate Island blueberries. After living in Toronto for 20 years, Dennis and Leslie bought their country home in Jordan in 2007 and bees were soon installed on the property. Dennis serves on the board of the Ontario Beekeepers’ Association and was an advisor to Niagara College on the design of their commercial beekeeping operation. D’s Bees Honey is available in 500gm, 1 kilo glass jars and 2.2 kilo pails directly from us by appointment or by accident. Please email us at deesbeeshoney@gmail.com to make sure we are home, for prices and directions. We are located at 2494 15th Street just a kilometre south of King Street where 15th Street ends at the escarpment. We do not sell bulk honey or beeswax. Our honey is also available at Chocolates Etc., 100 Welland Street in St. Catharines.